6-1/2 inch OD Smith 1330CID Replacement Cast Iron Drain Dome. Fits Smith 1330 Series Drains. Price/Each. 6-1/2 inch OD Smith 1330D Replacement Black Polyethylene Drain Dome. Fits Smith 1330 Series Drains. Price/Each. 7-1/4 inch OD Smith 1330C Replacement Cast Iron Flashing Clamp / Ring. Fits Smith 1330 Series Drains. Price/Each. 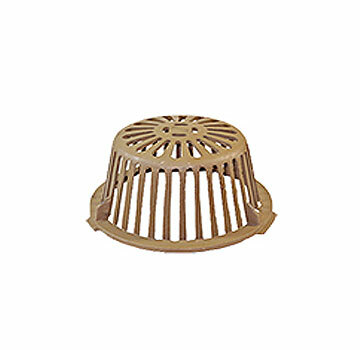 9-3/4 inch Diameter x 4-1/2 High Smith 1310 Replacement Drain Dome, Polyethylene. Fits All Smith 1310 and 1320 Series 12 inch Roof Drains. Price/Each.